When I was little, I loved making greeting cards with construction paper, scissors and glue. Many years later I went to Rhode Island School of Design and studied industrial design. 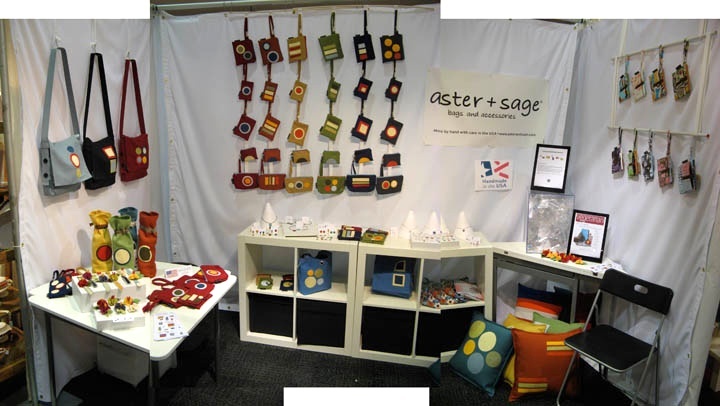 Aster+Sage combines my art school education with my love of colors and simple graphic designs. Lots of our products are made from recycled fabrics... while it's a hot topic right now, it's nothing new for me. Ever since I can remember I’ve been frugal with supplies--not a scrap of construction paper went to waste--and I’ve always tried to maximize utility from the materials I use. I also love using fabric that’s been manufactured with recycled content-- there’s also something exciting about using material that has existed before. In its previous life was it a different color? Was it a fabric scrap? Or a soda bottle? My philosophy is to design first and then find recycled materials to compliment the design. I don’t want my products to be limited by the availability of recycled material; I’d rather make dynamic products that include recycled content. I’m always on the lookout for more sustainable components. Let me know if you have any leads. It's a joy to make products that people love to use. Let me know what you think-- stay in touch!